During the fall-break, we had the most wonderful and happy time staying with family in England. DS had fun playing with his cousins, and we all enjoyed going for long walks in the beautiful autumn colored woods, and having drinks by the fire before dinner. I only wish we could have stayed longer, but sadly DS had to be back in school today! On our walks, I've been wearing jeans, a sweater and boots, combined with a jacket or cape, while adding a scarf and fur collar for warmth and cosiness. You are one of my biggest style inspirations and as soon as I can get a hermes scarf, your ring is on the list of accoutrements! 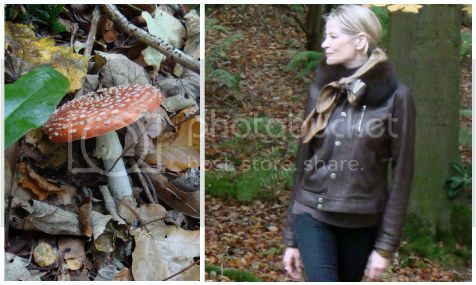 So beautiful and relaxed you look strolling through the stunning English countryside with DS! I adore the fur collar with your leather jacket....I will try to duplicate the look as the weather permits. Glad you had a lovely trip.Your photos are always wonderful.Welcome back. Welcome back dear MaiTai. I love the fur collar with the leather jacket. Thank you for sharing your lovely pics. Always inspired by your fashion vignettes. Is it possible for me to order a fur collar and have it shipped to the US of A ? Any idea of the shipping cost. You look utterly fabulous and what legs! Welcome back MT. Love the cape as well. Delightful pictures. Have a wonderful week. Yes, welcome back Dear MaiTai! Such beautiful surroundings in which to stroll. The fall colours really show-off the MetM CW - how beautiful. And yes, those legs, even in Wellies ;-). Oh, I just had a thought - what do you think of Bolduc ribbon laces? Love you cape in the last photo MT! Two of my very favourite scarves (still looking for the M & M one...), worn with perfect style as always! Hope you enjoyed your little break, MaiTai! Mwah, Tabitha, and mille merci! As wonderful it is to be away, it’s lovely to be back too. Thank you for the welcome back, dear SMR, and for your lovely words. Good thinking, my dear! Hugs and love from your bhbs! Well, as you say, the English countryside IS stunningly beautiful, but I can't help but think is was made more so by your presence. And, how did you find that perfectly wonderful mushroom? I half expected a fairy or two to pop out from behind it any minute. Welcome back, dearest MaiTai! You were trully missed! 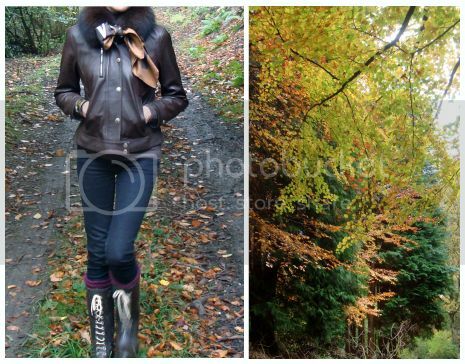 Love the beautiful pictures of you and your little prince surrounded by the wonderful Autumn nature! Your gray cape is very pretty and Madame et Monsieur has always been a favourite for me. Unfortunately I have never been able to find one. Dear MaiTai; Speaking of cooler temperatures, do you own any C/S PMs? I don't recall seeing any, and I could just be overlooking them. Aww, you are too kind, my dear Jerrine! The mushroom got spotted on our walk, and I could have sworn tht I saw a couple of elves rushing away as we approached.. Thank you, dear DD <3 I adored the boots too, but they were just borrowed for the walk, miss them already! Yes, what a year it has been, here’s to 2010! Hello, dear Maisie! Hope the postman has visited by now. I don’t have any CS PMs, but if they’d bring out one like the Damier, I'd be very tempted!